About Power Breakfast™ – Go Ahead! Engage in networking and discussion with senior executives. Hear two presentations from top experts, 20-25 minutes each addressing topical leadership issues, from diverse viewpoints. Enjoy a healthy and substantial breakfast in a pleasant environment. Relax and listen, no need to take notes—simply experience the presentations. They can be viewed and re-viewed on the Go Ahead! website. Since 2004, Power Breakfast has established itself as a leader in entrepreneur networking. Several times a year, Go Ahead! invites you to a 90 minute breakfast, which includes two 20-25-minute expert lectures on current topics. Go Ahead! always has its finger of the pulse of what is happening in the world at large and is always oriented to the interests and needs of business and the day-to-day challenges faced by entrepreneurs. Go Ahead! presents much more than simply information. Each invent is a platform for knowledge exchange and offers ideas and insights that are practical and immediately implementable.You benefit not only from the know-how of top speakers, but also from the lively debate with other audience participants. To find out about upcoming Power Breakfast events, click here. If you are interested in being a speaker at an upcoming Power Breakfast, please check out our speaker guidelines. Go Ahead! as a platform is founded in the Austrian School of Economic Thought, a very influential way of thinking which has spread around the world, and has been followed and improved upon by successful business thinkers. 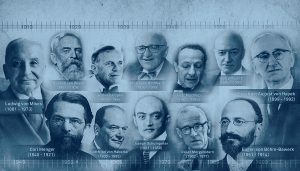 The Austrian School aims to restore the economy as a human-based science, not just a never-ending list of overlapping formulas. Carl Menger, Friedrich August von Hayek, and others demonstrated that capital is not homogeneous (composed of parts all the same in origin), but an intricate and diverse structure that has a time dimension.